For many, it is often difficult to imagine gay gathering places in the decades before the Stonewall riots of the 1960s, and nearly impossible to think of such communities outside the nation's largest cities. Yet such places did exist, and their histories tell amazing stories of survival and the struggle for acceptance and self-respect. When Ricardo J. Brown died in 1999, he left a compelling memoir of his youth and experiences as a young gay man in St. Paul. After being discharged from the navy for revealing his sexual orientation to a commanding officer in 1945, Brown returned to his hometown with a new self-awareness and a desire to find a group of people like himself. He discovered such a place in Kirmser's. A small neighborhood bar owned by a German immigrant couple in St. Paul's downtown, Kirmser's served working-class customers during daylight hours, but became an unofficial home to the gay men and lesbians who gathered there nightly in the years following World War II. The Evening Crowd at Kirmser's introduces us to often humorous but frequently tragic stories of those who would become the author's friends: Flaming Youth, a homely, sardonic man who carried the nickname from his younger years ironically into middle age; Bud York, the "All-American Boy," who seduced all with his wholesome good looks and confidence; Dickie Grant, a likable, gentle boy who is arrested for writing bad checks and is murdered while in prison; and Dale, the author's best friend, who suddenly loses his job of six years after an anonymous note informed his employer that he is gay. 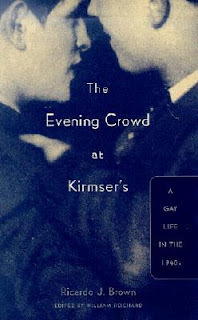 A revealing look at the origins of gay culture in a mid-sized city and among working-class people, The Evening Crowd at Kirmser's is destined to become a rare and unique classic. After reading Jeb and Dash: A Diary of Gay Life, 1918-1945, I decided to look for other books about gay life before Stonewall and found this little treasure at the library. As much as I enjoyed Jeb’s observations of the world, the historical details, and glimpses of famous personalities, I found his story somewhat dry, plodding, and lacking in personality. I breezed right through Ricardo Brown’s story of his early sexual experiences, his brief military career and dishonorable discharge for disclosing his homosexuality to his superiors, his family, the friends he made, and the bar they hung out at. Owned by a German couple, Kirmser’s was the only sanctuary for the gay and lesbian working-class inhabitants of St. Paul, Minnesota in the 1940’s. Even with the daytime crowd safely at home, one had to be careful entering the bar in order to avoid being seen. In those days, it was essential to live a double life, or risk abandonment, harassment, termination of employment, or arrest. Among friends, it was still necessary to be cautious. No one wanted to disclose too much personal information, or to be seen together outside of Kirmser’s. Engaging in subterfuge and lying was the only way to survive. In a time where men and women were expected to adhere to rigid gender expectations, deviating from the norm resulted in humiliation and punishment by well-intentioned family members. When things were bad and people needed an escape, there was always the movies. Though this is a short book, it is well written, engaging, and comprehensive. The intimate style exudes humor and warmth. While there is a glimmer of happiness for some of the characters, all of them suffer hardships and carry on with strength and dignity despite the prejudice that was a fact of their lives.